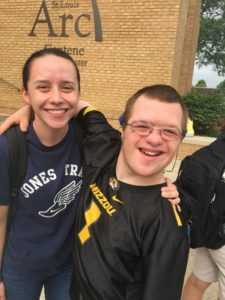 The Mission of the St. Louis Arc is to empower people with intellectual and developmental disabilities and their families to lead better lives by providing a lifetime of high-quality services, family support and advocacy. We are also guided by our core beliefs of Respect, Collaboration, and Empowerment. We work hard to provide the kind of individualized services that can really help make a difference to an adult… to a child… to a family. Services provided are designed to maximize choice and to support people as they build quality lives within the St. Louis community. The St. Louis Arc is recognized as a quality leader among professional agencies. Since 1983, St. Louis Arc has been accredited by The Council on Quality and Leadership (CQL), an international not-for-profit organization dedicated to being a leader for excellence in the definition, measurement and evaluation of personal and community quality of life for people with disabilities. CQL standards are recognized by federal and state government as benchmarks for quality. We have been accredited by CQL continuously since 1983. In 2004 we were one of the first to be awarded a Value-Added accreditation and in 2016 we became the eighth organization in the world to achieve Person-Centered Excellence Accreditation with Distinction. St. Louis Arc – What’s in a Name? As an affiliate chapter of The Arc of the United States, the St. Louis Arc has followed and adapted language and name changes in-line with the national organization over many years. In the 1990s, the Arc of the United States moved away from being an acronym, as did the St. Louis Arc. We are no longer branded or referred to as SLARC, the ARC or St. Louis ARC; we are simply, St. Louis Arc. We encourage all to learn more about the St. Louis Arc’s name and history. The St. Louis Arc emphasizes the use of “People-First Language” in all references to the individuals and families we serve. People-First Language helps us to remember that those we support are people who have individual interests, needs and desires. No one should ever be reduced to the sum of their diagnoses or conditions. It is a philosophy that underlies all of our services. Every four years, the St. Louis Arc dedicates time and resources to the strategic planning process. During this process we look at what planning can be done to align our mission, vision, and values to the supports we provide. The results of strategic planning are goals outlined over a four year period. We encourage you to learn more about the St. Louis Arc Strategic Plan for 2019 – 2022. With this plan, we believe our agency will become closer to accomplishing our vision, achieving our mission, and best representing our values. The St. Louis Arc meets the Standards for Charity Accountability of the Better Business Bureau.